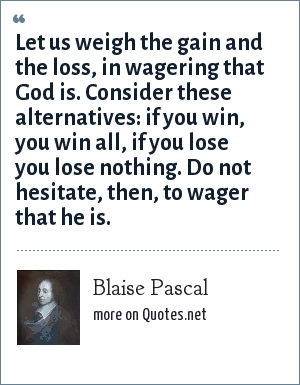 Blaise Pascal: Let us weigh the gain and the loss, in wagering that God is. Consider these alternatives: if you win, you win all, if you lose you lose nothing. Do not hesitate, then, to wager that he is. "Blaise Pascal Quotes." Quotes.net. STANDS4 LLC, 2019. Web. 23 Apr. 2019. <https://www.quotes.net/quote/39000>.